Anti-ageing is a topic I seem to cover quite a lot on the blog. I think once the 30s kick in women generally think about anti-ageing a lot more. When it comes to ageing, I always say prevention is better than cure therefore a good skincare routine is a must. So with that in mind, I started throwback Thursday! Throwing it back to the days of smooth, radiant and baby-soft skin. 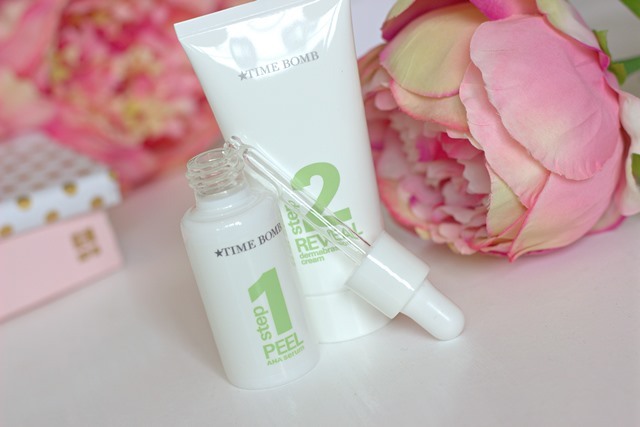 I have talked about Time Bomb before, when I introduced the initial skincare range (which I still use by the way!) 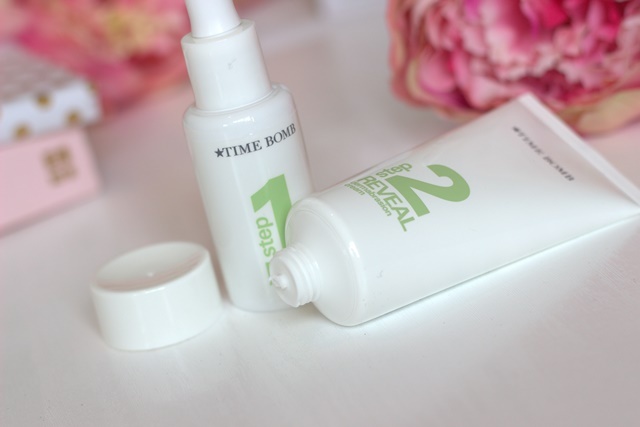 I also love the night cream so when Time Bomb launched the all new Peel and Reveal I was intrigued to try it. 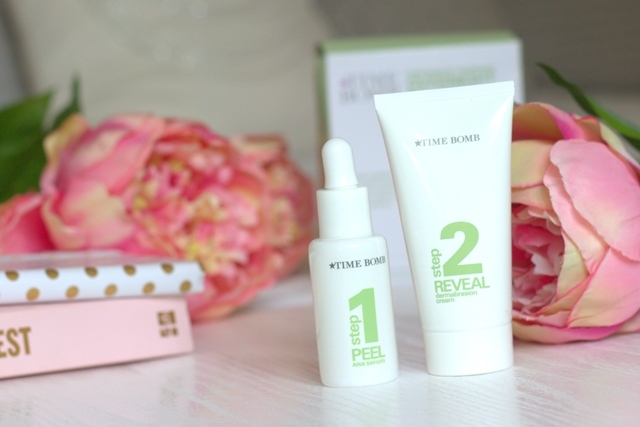 I love the concept of the brand and turning back time to reveal your own younger looking skin. I also love the packaging, clean enough to be sophisticated with a playful star. The new Peel and Reveal is made up of two steps, bringing you the best at home version of a chemical peel and dermabrasion. First the Peel AHA Serum containing glycolic acid and other acids. Using this as part of your skincare routine right before bed means that dead skin cells which are held on the surface of your skin are dissolved, working as a chemical peel while you sleep. Then place the Reveal Dermabrasion Cream by your sink for the morning (I’ve applied the serum at night then completely forgotten to use the cream the next morning!) speaking from experience here! In the morning you simple use the Dermabrasion cream to massage and buff away the layer of skin which has been loosened by the AHA Serum overnight. Peeling off the years and revealing younger looking skin. 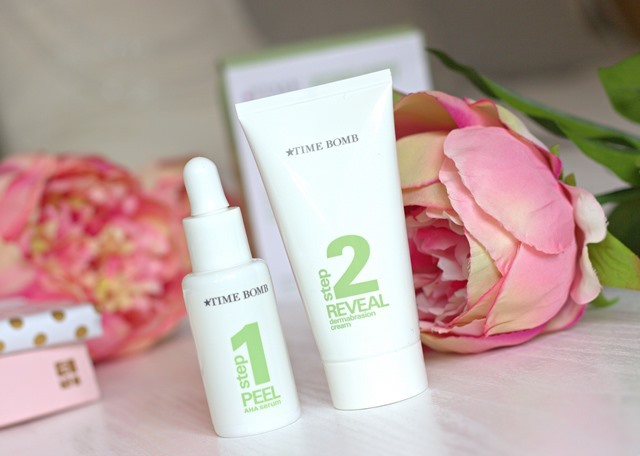 The first time you use the Peel and Reveal you will notice a clear difference. My skin looked radiant and brighter like I had just had a facial, well I did but whilst sleeping! It is recommended that you use these two products, that have been formulated to work together, once a week. Preferably on a Thursday so you are glowing for the weekend hence Throwback Thursday! Of course if you have a big event mid-week then use it the night before, we just can’t call it #throwbackthursday but if your skin is glowing who cares just enjoy it.